Yoga can be for all of us, no matter what body type or level of experience. Yoga is about mindful movement. It’s about opening your inner world, and in the meantime enhancing your physical health. My classes are very welcoming and joyful. At every level class we warm up and lubricate the joints as we slowly focus on overall stretching, strengthening, and mindfulness to bring down stress and promote feeling alive and healthy. Each class is customized for those in attendance. 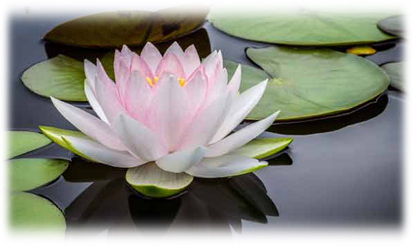 Christine Justice is a certified Kripalu yoga instructor and practitioner of mindful living. Her style of teaching brings mindfulness to yoga practice and encourages loving-kindness toward oneself and the world. Chris offers classes, retreats, and individual instruction in the Monadnock region of southwestern New Hampshire. I loved the Retreat and I thank you and Lindsay for taking such good care of us. I felt pampered and very comfortable and there was so much good energy from everyone. I came because I have felt very comfortable in your classes and appreciate your approach to yoga. Yoga is obviously very personal for you and it comes through. Your attention to all aspects of the experience and your kindness and compassion always have made the classes feel comforting and positive. Here you will find interesting thoughts, articles, artwork, etc. to support your yoga practice or to help you start one. We can assess our practice by asking only whether Yoga practice is building our integrity as a human being and helping us live as an expression of our most noble virtues. Whether our practice strengthens our ability to be present with all that we experience is the only criteria we need for what we do or don’t do on the mat. This class is open to all levels and is very welcoming. After centering with focus on the breath, we will begin with easy, gentle stretching and move into a sequence of poses to awaken your energy. Our poses may be challenging, but you will be encouraged to experience your own individual level of movement within the pose. You will become stronger, more flexible, and at ease in mind and body. Each class ends with a period of total relaxation to allow your practice to settle within you. Yoga is most joyful when we move with our own rhythm and flow. Every yoga practice evolves and changes with time, age, and life circumstance. This class is a gently lead exploration of yoga, focusing on sequences you can maintain for the rest of your life. We are all encouraged to find our best expression of poses, and to practice from the inside out. Most of us are 50 and older, but this is a very friendly class and everyone is welcome. Mats, blocks, bolsters, straps, and blankets are available. Yoga has taught me to relax both physically and mentally. I’ve learned how to improve my balance and strength in a stress-free environment. In the process, I’ve learned more about myself and have become more open to new ideas. This class is open to KSC faculty and staff and is designed to bring down stress and enhance mindfulness. Whether you are beginning or continuing your yoga practice, join us and experience the joy of gentle movement and body awareness. We’ll warm up and lubricate the joints and slowly focus on overall stretching, strengthening, and mindfulness to promote feeling alive and healthy. Each class ends with a short period of total relaxation to allow your practice to settle within you. Wear comfortable clothing and bring your own mat. This class begins January 9. Lindsay Taflas will lead the class on the first Monday of each month. While I’ve been practicing yoga for years, Chris’ teachings have taught me to truly bring yoga “from the mat” into my everyday life. She encourages her students to stay keenly in touch with our bodies, and either gently encourages exploring new territory, or backing away into a more restful pose. These are good life lessons that I find useful every day! Gentle yoga movement warms and lubricates the joints, focuses the breath, improves balance and circulation, and strengthens the body. It promotes feeling alive and healthy through awareness and appreciation of the body. And it lifts the spirit through connection with self and others. Currently the class is offered to residents of Summerhill Assisted Living on Tuesday morning, and to residents of RiverMead Lifecare Community on Monday mornings. I think these exercises you do are deceptively effective. If a specific class or retreat needs to be cancelled, current students will be notified by e-mail; new students should check here or contact Chris. Click on specific class/retreat for more information. Several times each year I offer restorative yoga retreats. if you have an idea you would like developed into a retreat, let me know. want a customized retreat for your organization, staff, friends, or a special celebration? Contact me with your thoughts and questions. This Deep Peace Restorative Retreat is a time for Coming Home. Coming Home means finding your authentic self. It means being in touch with a place inside that is beyond the reach of anything, or anyone. It is beyond language, beyond thought. There is no judgment, no striving, no ambition, and no despair. It is a place of simply being. And when you touch it, you know it is good. You know it is what you are. It is from this place that the best of you emerges. And in this place spirit lies. From this place, you touch what is real. It is intensely personal, and it is universal. During this retreat you will experience gentle stretching, restorative yoga poses, and guided meditation. I invite you to this practice of coming home. Everyone is welcome – no experience is necessary. You will leave relaxed and refreshed. This is guaranteed. Chakras are energy centers within the body that help regulate our physical, emotional, mental, and spiritual processes. Through exploration of these energy centers we begin to ask, feel, and understand what motivates our thinking. We consider the internal forces that influence our actions, and learn how we can work with them and how to bring them into balance. As we travel through the chakras, we will use breath, meditation, chanting, and movement – both slow and vigorous – in our afternoon together. You will gain tools for knowing yourself, and deepening your yoga practice. Everyone is welcome, no experience necessary. Practice gives us direct access to an internal and ever present refuge of peacefulness that exists inside of and despite all polarities. We make it our task then to love what we cannot possibly understand by letting the mind lie down and the wisdom of the heart take over. 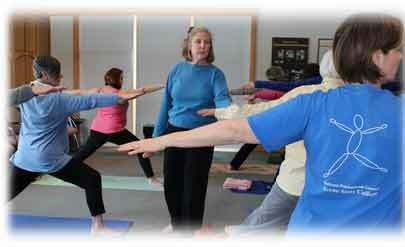 A yoga retreat to benefit the Society for the Protection of New Hampshire Forests. Join the retreat, or give your support of any amount. Every penny we raise will go directly to the Forest Society. Power & Grace. Yoga offers both – physically, emotionally, and spiritually. This is an active retreat. Through easy to moderate poses, we will explore yoga technique and consider strength, patience, and acceptance in our practice. This is a time to settle into your pose for a deeper understanding and appreciation. Always encouraging you to listen deeply to what your body asks, I might offer you hands-on assists and hope you will ask questions or share your experience with us. This retreat always brings unexpected insights to participants. Some yoga experience is helpful, or come with an open and adventurous spirit. Founded in 1901, the Society for the Protection of N.H. Forests has helped to conserve more than 1 million acres of land in New Hampshire. Please make checks out to: NH Forest Society. All proceeds from this retreat will benefit the Society for the Protection of New Hampshire Forests. Forest Society work encourages land conservation, management of working forests, recreation on conserved lands, clean water, and preservation of wildlife. 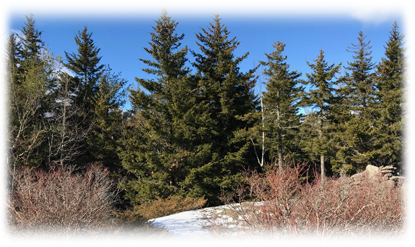 Visit: Society for the Protection of New Hampshire Forests. Space is limited, preregistration is requested. Please make reservations through the Registration button below. Yoga With Chris Justice © 2019. All Rights Reserved.